Tchavdar Iliev (sometimes spelled as Tjavdar Iliev), born in 1950, is originally from Montana, a small place in the northwest of Bulgaria. After the gymnasium he studied at the Academy of Fine Arts in Sofia, Bulgaria. He focused mainly on monumental sculptures, in which he specialized later. After he graduated in 1976, he got hired as an art consultant for the Bulgarian government. His first job was to make a big monument which was about 75.000 kilograms. In his first years as an artist, Iliev made many large monuments across whole Bulgaria. These monuments were made out of stone, marble, aluminum and you can find his work to date on squares, at banks, in schools and government buildings. Since 1990, Tchavdar Iliev is based in Amersfoort, The Netherlands. Mr. Iliev and his family received Dutch citizenship based on his high quality of work and his growing numbers of admires. You can find his work at big multinationals like insurance companies and banks in The Netherlands Companies like Centraal Beheer in Apeldoorn, Achmea in Zeist, FBTO, Avero-Torn MI/partners and Steel Bankiers in The Hague have been big supporters of Iliev’s work. Next to the big multinationals, Iliev has also many private clients that truly admire the style that he is so famous for. In 2003, Tchavdar Iliev got selected for the World Art Collection exhibition in Seoul, South Korea where he represented The Netherlands. His sculpture titled ‘Centaurus’ was also published in the World Art Encyclopaedia of 2004. Besides working with big multinationals, Iliev also works with private clients and when times allow it, participates in different exhibitions in The Netherlands but also abroad. Movement, balance and tension are key words in his work. His personal style is characterized by abstraction of figurative elements in sober and powerful lines. He finds the right balance and tension by creating the sculpture around a vertical line. At the intersection of contour lines tension is created and this creates a certain effect, which can make one sculpture look totally different, depending from which angle you are looking at. Creating the idea first and later the technical development, with almost old-fashioned attention to perfection, costs Iliev enormously much attention and time. Iliev distinguish himself from other artists as almost all his sculptures are unica and one copy only. Also he is one of the few artists left that still pours his own sculptures. Already from the very first moment that the idea of a sculpture is developed, Iliev decides in which way he will pour the sculpture, which color the pedestal should be, so that the sculpture and the pedestal will form one line together. Returning element in his work are horses. Dynamic, movement and beauty, are his biggest inspiration when it comes to this beautiful animal. Currently he is working on sculptures for clients in the Middle East. 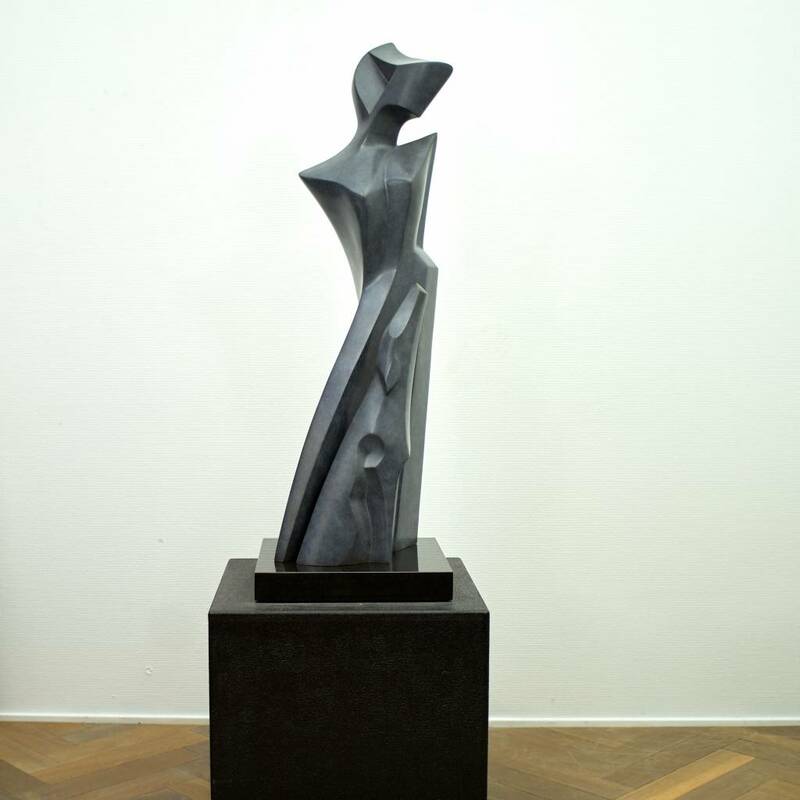 In 2016 Tchavdar Iliev received the prestigious ‘Van Ommeren de Voogt’ price for his sculpture ‘Capricorn’.